Sky Palace Hostel, Guilin, Chiny : Rezerwuj teraz! The amazing Sky Garden Hostel has finally opened its doors in Guilin! It is the sister hostel of Ming Palace International Hostel which has consistenly received great reviews over the past five years. We've picked out the best location you can find in Guilin. We are located centrally in downtown Guilin, 1 minute’s walk away from the following attractions:- Zhengyang Pedestrian street (perfect for bar hopping and shopping), the newly opened East and West Lane and XiaoYao Tower, and Li River bank. All the major tourist attractions including The Elephant Trunk Hill， Seven Star Park, Sun and Moon Twin Pagodas and Jingjiang PrincesPalace are within 10 minutes’ walking distance from the hostel. From Guilin Northern Train Station you can get here by No. 1 or No. 100 bus, and from Guilin Southern Train Station by No. 11 or No. 99 bus. The bus stop is situated right in front of the hostel. Follow our easy directions and you'll be checked-in and ready to explore this breath-taking town in no time at all. Our hostel comes with an impressive 500m2 Sky Bar - the largest rooftop bar to chill out in Guilin! 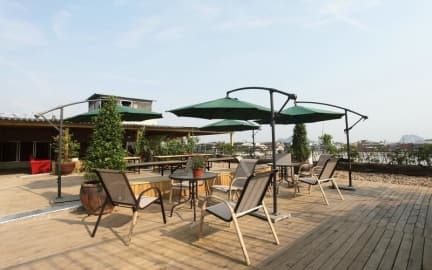 Sky Bar is a casual but classy establishment consisting of an outdoor sky bar, in-door lounge, covered outdoor terrace and unparalleled breath-taking views of the city surrounded by mountains. We provide customers with the unique opportunity of eating a meal from our wide selection of Western and Chinese menus, and drinks from our cocktail menu. Our menus include Western style breakfast, pizza, sandwich, high quality western style coffee and Chinese delicacies. We are the only hostel in the city with an elevator, providing guests with convenient large luggage access. Our hostel also features all new facilities such as separate shower/toilet in the washrooms, custom-built beds with comfortable mattresses, and windows with natural lighting. We host great activities for guests! Besides these weekly activities, we also offer FREE hiking and guided city walk! To give guests a cultural Chinese experience, we celebrate the major traditional Chinese Festivals such as Spring Festival, Dragon Boat Festival, Moon Cake Festival with our guests. We will happily arrange excursions to places like LiRiver cruise or bamboo raft to Yangshuo and Longshen Rice Terraces. We can also give you plenty of information on many local attractions including Two-Lake Four-River cruise, Elephant Trunk Hill and Reed Flute Cave, Seven Star park, The Gudong Waterfall and more. You will be able to enjoy a good discount for tour booking and bicycle rental via our booking service. 2).Our check in time is after 2pm and check out time is before 12:00 noon.